Chelsea manager Antonio Conte said he was delighted with the "fight" his side showed in their 1-0 win at Bournemouth. Eden Hazard's goal early in the second half was enough to earn his side three points and leave them fourth in the Premier League. The Belgian hit a firm shot past Asmir Begovic at the goalkeeper's near post after defender Simon Francis failed to cut out a ball over the top. Conte had reacted angrily to reports suggesting his players were unhappy with his training methods ahead of the visit to the south coast. Chelsea's Premier League defence had begun with defeat at home to Burnley, when Gary Cahill and Cesc Fabregas were sent off, and Conte was without Hazard due to injury until early September. "We started the season without Hazard, we had two red cards for our players, we've had injuries so we've had a lot of problems but today was a good win," said Conte. "Our players are very honest, they want to fight." Begovic had pulled off a fine save in the first half to deny Alvaro Morata, who also found the net only to see Cesar Azpilicueta flagged for offside. The hosts failed to manage a shot on target until Steve Cook's effort in the 92nd minute and remain one place off the foot of the table. Had Cesc Fabregas converted a chance late in the game, it would have given the scoreline a fairer reflection of Chelsea's dominance, but they still moved back above Arsenal on goal difference. A win to improve Conte's mood? Conte lashed out at allegations that his players are unhappy about his training sessions in his news conference ahead of the visit to Bournemouth. With Chelsea starting the day in fourth place and nine points behind leaders Manchester City, anything less than three points for Conte's side would have raised more questions about their ability to defend their Premier League title. What the Italian's team gave him was not a vintage Chelsea performance, but one good enough to give them a win that may help settle some frayed tempers. They managed a first clean sheet in seven outings in all competitions since the 4-0 win at Stoke on 23 September, seeing out the game with a disciplined performance against opponents who could not convert effort into chances. The home side welcomed the champions at the end of their best week of the season so far, which featured a first away win in the league at Stoke and a 3-1 victory in the Carabao Cup over Middlesbrough. Hopes would have been high that they could build on the last few days, but instead but they struggled to lay a glove on Chelsea. Visiting keeper Thibaut Courtois did not have a save to make until stoppage time at the end of the match, with the Cherries the second-lowest scorers in the division with just six goals in 10 games. "It wasn't a great first half from our perspective," admitted Bournemouth coach Eddie Howe. "We were too passive, stood off Chelsea too much and with the quality they had, it made it difficult for us. "These games hurt you - we need to find a way to draw or even win these games. It's a challenge as we've gone from being a free-scoring team. "I don't see a problem with the creative players we've got, we just need to find the right formula." Jermain Defoe, absent for the last two games with a hamstring injury, struggled to make an impact and was replaced at half-time in what Howe admitted after the match was a tactical move. The hosts improved in the second half and enjoyed better possession than before the break, but their lack of threat will worry Howe. For all the focus on Conte regarding his training methods and rumours the club may look to former manager Carlo Ancelotti, his side are unbeaten in their last five outings across all competitions. They face Roma in the Champions League on Tuesday, but their next Premier League match sees the visit of Manchester United on Sunday, 5 November. Chelsea's last defeat came when Manchester City visited Stamford Bridge, with the 1-0 result not reflecting how convincingly the home side were beaten that day. Bournemouth coach Eddie Howe: "We were resilient but too passive in the first half. We had to change things and we did. We are disappointed with the goal, but didn't quite have the quality we needed. "I don't think we hurt them, we didn't stretch their back five and a poor touch here and there stopped us. There were positives from the second half, not the first - you have to give Chelsea a lot of credit for that. "I think we have a run of games where we have to do win. I think you need to have a good run during the season, it'll make a huge difference, we're prepared." Chelsea manager Antonio Conte: "I think we deserved to win because we played good football. When you have a lot of chances to score, I think you must do it. "To keep the result to only 1-0 can be dangerous. I think today that if I have to find a negative aspect, we could be more clinical. "We must be pleased for the clean sheet. It's OK when you don't concede a goal, it means you are finding solidity which is very important for a team like Chelsea. We played a good game with a good balance and finally I think we deserved to win." 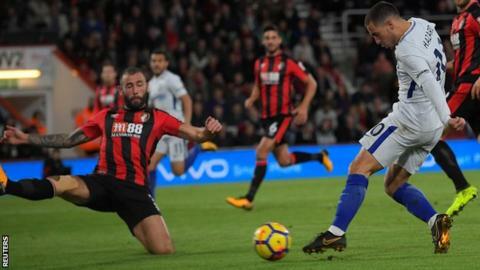 Eden Hazard has scored five goals in five Premier League appearances against Bournemouth, with four of those strikes arriving on the south coast. Hazard created seven goalscoring chances in the game; only Mesut Ozil (eight v Everton) has managed more in a single Premier League game this season. Chelsea have won six of their last seven away Premier League games, losing the other. Bournemouth have picked up just four points from their five Premier League home games this season (W1 D1 L3), after accruing 10 points from their last five last season (W3 D1 L1). Their tally of just one shot on target is the Cherries' joint-lowest total ever in a home Premier League game. Alvaro Morata has been involved in nine goals in his nine Premier League games this season (six goals, three assists). Chelsea travel to the Italian capital to face Roma on Tuesday, 31 October (kick-off 19:45 GMT), then host Manchester United at 16:30 on Sunday, 5 November. Bournemouth's next outing is at Newcastle on Saturday, 4 November, at 15:00. Match ends, Bournemouth 0, Chelsea 1. Second Half ends, Bournemouth 0, Chelsea 1. Attempt saved. Steve Cook (Bournemouth) right footed shot from the centre of the box is saved in the top centre of the goal. Assisted by Adam Smith. Simon Francis (Bournemouth) is shown the yellow card. Attempt missed. Michy Batshuayi (Chelsea) left footed shot from the left side of the box misses to the right. Assisted by Willian with a headed pass. Offside, Chelsea. Cesc Fàbregas tries a through ball, but Davide Zappacosta is caught offside. Attempt missed. Cesc Fàbregas (Chelsea) right footed shot from a difficult angle on the left is just a bit too high. Assisted by Eden Hazard. Corner, Bournemouth. Conceded by César Azpilicueta. Substitution, Chelsea. Daniel Drinkwater replaces Pedro. Attempt blocked. Callum Wilson (Bournemouth) right footed shot from the right side of the six yard box is blocked. Assisted by Jordon Ibe. Substitution, Bournemouth. Callum Wilson replaces Benik Afobe because of an injury. Delay in match Benik Afobe (Bournemouth) because of an injury. Attempt missed. Marc Pugh (Bournemouth) header from the centre of the box is high and wide to the left. Assisted by Adam Smith with a cross. Offside, Chelsea. Cesc Fàbregas tries a through ball, but Marcos Alonso is caught offside. Attempt saved. Pedro (Chelsea) left footed shot from outside the box is saved in the centre of the goal. Assisted by Álvaro Morata. Attempt missed. Jordon Ibe (Bournemouth) right footed shot from outside the box is too high. Assisted by Lewis Cook. Attempt missed. Eden Hazard (Chelsea) right footed shot from the centre of the box is high and wide to the right. Assisted by Pedro. Substitution, Bournemouth. Marc Pugh replaces Junior Stanislas because of an injury. Attempt blocked. Jordon Ibe (Bournemouth) left footed shot from the centre of the box is blocked. Assisted by Junior Stanislas. Attempt missed. Tiemoué Bakayoko (Chelsea) left footed shot from outside the box is high and wide to the left. Goal! Bournemouth 0, Chelsea 1. Eden Hazard (Chelsea) left footed shot from the left side of the box to the bottom left corner. Assisted by Álvaro Morata. Attempt missed. Lewis Cook (Bournemouth) right footed shot from outside the box is too high. Assisted by Andrew Surman. Substitution, Bournemouth. Jordon Ibe replaces Jermain Defoe. Attempt missed. Marcos Alonso (Chelsea) header from the centre of the box misses to the left. Assisted by Davide Zappacosta with a cross. Attempt blocked. Marcos Alonso (Chelsea) header from the centre of the box is blocked. Attempt blocked. Cesc Fàbregas (Chelsea) left footed shot from the right side of the six yard box is blocked. Attempt blocked. Cesc Fàbregas (Chelsea) right footed shot from the centre of the box is blocked. Assisted by Pedro.